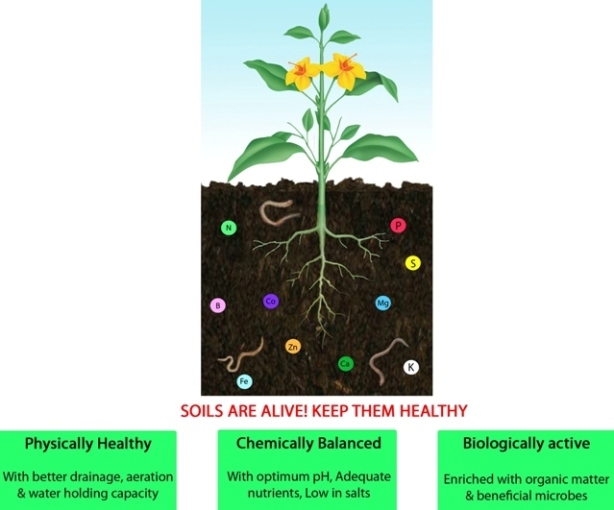 Soil pH & Importance: Chemical health of soil is critical part of total soil health to facilitate healthy root activity and maximum nutrient absorption. low in salts such as sodium and chlorides. Chemical health problems in soils or potting mixes mainly arise from either “too much “or “too little “conditions. Why Test Your Soil pH and what is the importance? 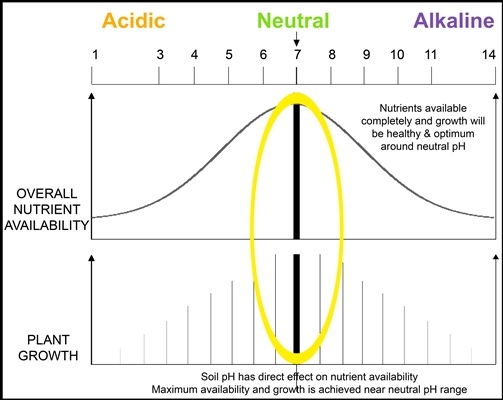 Soil pH has direct influence on root activity, availability and absorption of nutrients by plants. Most nutrients are easily available at a pH range of 6 -7. 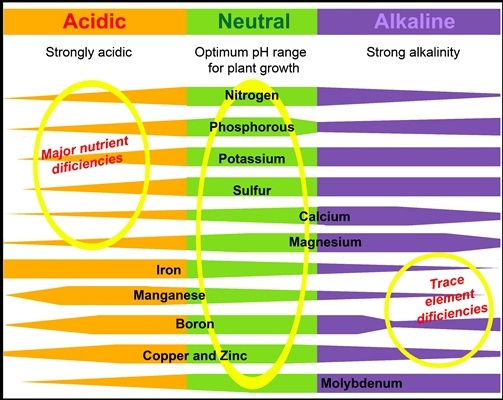 Under alkaline conditions, trace elements such as Iron, Zinc & Manganese are trapped in the soil and cannot be taken up by the plant even though plenty supplied and available in soils; hence in alkaline soils we commonly see as yellowing (deficiency) of top/fresh growth due to lack of availability of trace elements which is common in most vegetables and Fruit/Flower and Citrus trees. On the other hand, under high acidic conditions, major nutrients like Nitrogen, Phosphorus, Potassium, Magnesium and Calcium become less available resulting in deficiency symptoms. Regular maintenance and application of corrective nutrient elements is necessary to overcome deficiencies under these conditions. The availability of nutrients to plants varies as pH changes. Different plant groups have a different pH preferences. Most plants prefer and grow well at a pH range of 6-7 (i.e. slightly acid to neutral). However there are exceptions like acid loving plants such as Azalea, Camellia, Gardenia, Blue Hydrangeas, Blue berries etc. which prefer an acid soil pH of 5 – 6. On the other hand,pink Hydrangeas and Figs can survive under slightly alkaline pH. Unlike other plants Hydrangeas are very fascinating as flowers change color dramatically depending on soil pH conditions, particularly Blue & Pink Hydrangeas. Click here to read more on the importance of pH on Hydrangea coloring. Soil pH & regional differences: Knowing the pH of soil or growing media is crucial to understand a large number of garden problems, particularly in Australian soil conditions, where we have patches of volcanic acidic soils to coastal lime (alkaline) soils, or even within suburban yards, debris of building/construction materials or poor quality soil or compost when added will influence soil pH. Environmental factors such as high rainfall (tend to cause acidic soils), temperature or even soil physical structure (being sandy/clay/organic conditions) can also influence pH to change. Hence it is important to test and know the pH of your soil so that you can monitor and adjust pH to optimal condition. Optimal soil pH required by plants is something similar to optimal/normal blood pressure our body required to function properly; the same analogy applies here for plants.